Najafi, A., Merrikhi, E., Shahsavar, A. (2018). Project resource investment problem under progress payment model. 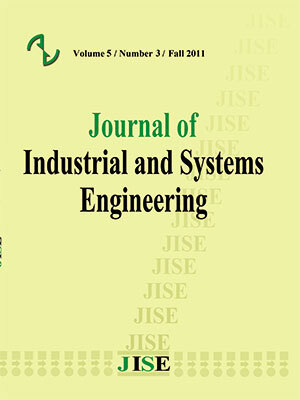 Journal of Industrial and Systems Engineering, 11(3), 84-101. Amir Abbas Najafi; Elham Merrikhi; Aria Shahsavar. "Project resource investment problem under progress payment model". Journal of Industrial and Systems Engineering, 11, 3, 2018, 84-101. Najafi, A., Merrikhi, E., Shahsavar, A. (2018). 'Project resource investment problem under progress payment model', Journal of Industrial and Systems Engineering, 11(3), pp. 84-101. Najafi, A., Merrikhi, E., Shahsavar, A. Project resource investment problem under progress payment model. Journal of Industrial and Systems Engineering, 2018; 11(3): 84-101. As a general branch of project scheduling problems, resource investment problem (RIP) considers resource availabilities as decision variables to determine a level of employed resources minimizing the costs of the project. In addition to costs (cash outflows), researchers in the later extensions of the RIP took payments (cash inflows) received from clients into account and used the net present value (NPV) of project cash flows as a financial criterion evaluating the profitability of the project. A striking point in a financial view of the project scheduling is how cash inflows are paid by the client. There are different payment models in the literature of which progress payment is highly common in practice. In this paper, resource investment problem with maximization of the NPV under progress payment model is investigated. A new mathematical model is developed for the problem and then two metaheuristic algorithms based on the genetic algorithm (GA) and simulated annealing algorithm (SA) are suggested. The experimental results of algorithms are compared with some near-optimal solutions derived from LINGO software. The comparisons show that the results of GA are more reliable than SA. Afshar-Nadjafi, B. (2014). Multi-mode resource availability cost problem with recruitment and release dates for resources. Applied Mathematical Modelling, 38(21-22), 5347-5355. Ahuja, H. N. (1976). Construction performance control by networks. New York; Toronto: Wiley. Demeulemeester, E. (1995). Minimizing resource availability costs in time-limited project networks. Management Science, 41(10), 1590-1598. Doersch, R. H., & Patterson, J. H. (1977). Scheduling a project to maximize its present value: A zero-one programming approach. Management Science, 23(8), 882-889. Drexl, A., & Kimms, A. (2001). Optimization guided lower and upper bounds for the resource investment problem. Journal of the Operational Research Society, 52(3), 340-351. Elmaghraby, S. E., & Herroelen, W. S. (1990). The scheduling of activities to maximize the net present value of projects. European Journal of Operational Research, 49(1), 35-49. Etgar, R. (1999). Scheduling project activities to maximize the net present value the case of linear time-dependent cash flows. International Journal of Production Research, 37(2), 329-339. Etgar, R., Shtub, A., & LeBlanc, L. J. (1997). Scheduling projects to maximize net present value—the case of time-dependent, contingent cash flows. European Journal of Operational Research, 96(1), 90-96. Etgar, R., & Shtub, A. (1997). A branch and bound algorithm for scheduling projects to maximize net present value: the case of time dependent, contingent cash flows. International Journal of Production Research, 35(12), 3367-3378. Grinold, R. C. (1972). The payment scheduling problem. Naval Research Logistics Quarterly, 19(1), 123-136. Herroelen, W. S., & Gallens, E. (1993). Computational experience with an optimal procedure for the scheduling of activities to maximize the net present value of projects. European Journal of Operational Research, 65(2), 274-277. Javanmard, S., Afshar-Nadjafi, B., & Niaki, S. T. A. (2017). Preemptive multi-skilled resource investment project scheduling problem: Mathematical modelling and solution approaches. Computers & Chemical Engineering, 96, 55-68. Kazaz, B., & Sepil, C. (1996). Project scheduling with discounted cash flows and progress payments. Journal of the Operational Research Society, 47(10), 1262-1272. Möhring, R. H. (1984). Minimizing costs of resource requirements in project networks subject to a fixed completion time. Operations Research, 32(1), 89-120. Myers, R. H., Montgomery, D. C., Vining, G. G., Borror, C. M., & Kowalski, S. M. (2004). Response surface methodology: a retrospective and literature survey. Journal of quality technology, 36(1), 53-77. Najafi, A. A., & Azimi, F. (2009). A priority rule-based heuristic for resource investment project scheduling problem with discounted cash flows and tardiness penalties. Mathematical Problems in Engineering, 2009. Najafi, A. A., & Niaki, S. T. A. (2006). A genetic algorithm for resource investment problem with discounted cash flows. Applied Mathematics and Computation, 183(2), 1057-1070. Najafi, A. A., Niaki, S. T. A., & Shahsavar, M. (2009). A parameter-tuned genetic algorithm for the resource investment problem with discounted cash flows and generalized precedence relations. Computers & Operations Research, 36(11), 2994-3001. Nübel, H. (1999). A branch and bound procedure for the resource investment problem subject to temporal constraints. Inst. für Wirtschaftstheorie und Operations-Research. Nübel, H. (2001). The resource renting problem subject to temporal constraints. OR-Spektrum, 23(3), 359-381. Qi, J. J., Liu, Y. J., Jiang, P., & Guo, B. (2015). Schedule generation scheme for solving multi-mode resource availability cost problem by modified particle swarm optimization. Journal of Scheduling, 18(3), 285-298. Ranjbar, M., Kianfar, F., & Shadrokh, S. (2008). Solving the resource availability cost problem in project scheduling by path relinking and genetic algorithm. Applied Mathematics and Computation, 196(2), 879-888. Rodrigues, S. B., & Yamashita, D. S. (2010). An exact algorithm for minimizing resource availability costs in project scheduling. European Journal of Operational Research, 206(3), 562-568. Russell, A. H. (1970). Cash flows in networks. Management Science, 16(5), 357-373. Sabzehparvar, M., SEYED, H. S., & Nouri, S. (2008). A mathematical model for the multi-mode resource investment problem. Sepil, C., & Ortac, N. (1997). Performance of the heuristic procedures for constrained projects with progress payments. Journal of the Operational Research Society, 48(11), 1123-1130. Shadrokh, S., & Kianfar, F. (2007). A genetic algorithm for resource investment project scheduling problem, tardiness permitted with penalty. European Journal of Operational Research, 181(1), 86-101. Shahsavar, M., Najafi, A. A., & Niaki, S. T. A. (2011). Statistical design of genetic algorithms for combinatorial optimization problems. Mathematical Problems in Engineering, 2011. Smith‐Daniels, D. E., & Aquilano, N. J. (1987). Using a late‐start resource‐constrained project schedule to improve project net present value. Decision Sciences, 18(4), 617-630. Tiwari, R. N., Dharmar, S., & Rao, J. R. (1987). Fuzzy goal programming—an additive model. Fuzzy sets and systems, 24(1), 27-34. Vanhoucke, M., Demeulemeester, E., & Herroelen, W. (1999). Scheduling projects with linear time-dependent cash flows to maximize the net present value. Yamashita, D. S., Armentano, V. A., & Laguna, M. (2006). Scatter search for project scheduling with resource availability cost. European Journal of Operational Research, 169(2), 623-637. Zimmermann, J., & Engelhardt, H. (1998). Lower bounds and exact algorithms for resource leveling problems. Report WIOR-517, University Karlsruhe. Zoraghi, N., Shahsavar, A., Abbasi, B., & Van Peteghem, V. (2017). Multi-mode resource-constrained project scheduling problem with material ordering under bonus–penalty policies. Top, 25(1), 49-79.